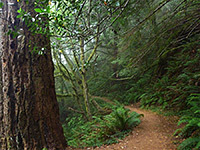 There are three main trails in Humbug Mountain State Park, amongst the largest of the many state preserves along the south coast of Oregon. One follows a section of old US 101 roadbed, parallel to the existing highway, another explores part of the steep-sided valley of Brush Creek, while the most popular is to the summit of the mountain, which at 1,756 feet is amongst the highest peaks in the state to rise directly from the ocean. 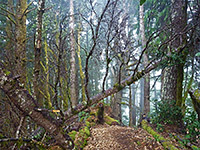 This path, the Humbug Mountain Trail, starts close to an overgrown ravine, later crossing over and arriving a junction after one mile, from where both branches climb further and meet again just below the summit, which is reached by a very short spur. 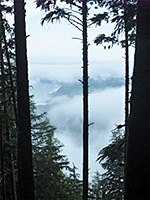 The summit has a small grassy clearing but is enclosed by trees on all sides so there are no grand views here, and lower down the ocean is glimpsed only briefly through gaps in the tall, old growth woodland. The hike is still very rewarding though, owing to the forest itself - the understory vegetation is dense and varied, including a good selection of wildflowers, and the trees are large, flourishing and closely-spaced, creating an endless variety of scenes. Both sides of the loop are similar in distance and steepness, so most people climb one way and return the other. The eastern route is more affected by traffic noise, and has some different views, of higher hills inland. 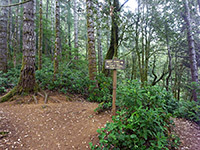 The Humbug Mountain trailhead is at a large parking area on the south side of US 101, in the valley of Brush Creek, a third of a mile from the coast. A short path crosses the creek and links with the adjacent road through the state park campground. There is no fee for parking. The path leaves the spacious, open parking area and immediately enters thick, dark woodland, close to an overgrown drainage, which is sometimes dry but usually contains some flowing water. After climbing a short distance, the route veers east, traversing the hillside above the highway within sight of Loop B of the campground, before rounding a ridge right at the northern edge of the mountain then moving back west. 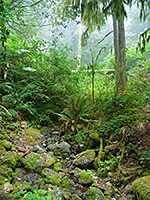 The rich undergrowth includes mosses, ferns, redwood sorrel and trees in a range of sizes, some very thick though not comparable in dimensions to the giant redwoods of the northern California coast. 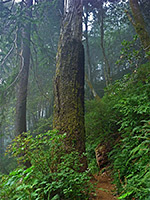 The main tree species are western red cedar, Douglas fir, spruce, tanoak, alder and Oregon myrtle. 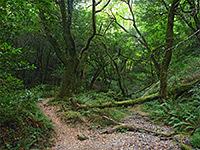 The vegetation thickens as the trail approaches the upper section of the drainage passed at the start; the creekbed is crossed on a bridge, and after another traverse, not too steep, the path arrives at a junction at the beginning of the loop section, signed East 2 miles, West 1.5 miles (the park brochure gives the distances as 1.8 miles and 1.6 miles respectively). The east path continues climbing, moderately steeply, close to the crest of a sloping ridgeline, over another small stream lined by several different species of flowers, and around a wide bend, after which the noise of traffic is more audible, and the trees rather smaller, with less undergrowth. A sign gives the cumulative distance as 2 miles. The next section is straight and due south, up to the 2.5 mile post, followed by a tighter bend back north, to another ridge which is followed for a while; the land now slopes down noticeably on both sides, and the outline of the summit is visible ahead. A few more bends in quick succession lead to the final junction, where the western route continues ahead, while the summit is 100 feet south. 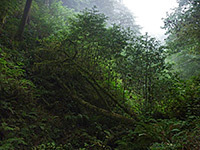 The mountaintop is unremarkable - an open area 150 feet across, covered by grass and ferns, angled southwest though largely shielded from the ocean by the surrounding trees. The west branch of the path is quite bendy at first, winding down the west arm of the mountain, dropping 700 feet in less than a mile. The trees are somewhat taller, thinner and less closely-spaced compared with those to the east, reflecting the slightly more exposed conditions. The best of the transient coastal views are to the north, towards the beach at the mouth of Brush Creek. The unusual Indian pipe plant is abundant along some sections, including near the 1.5 mile post, where the path crosses a minor drainage. After here, a longish northwards straight leads back to the junction at the start of the loop, one mile from the trailhead.